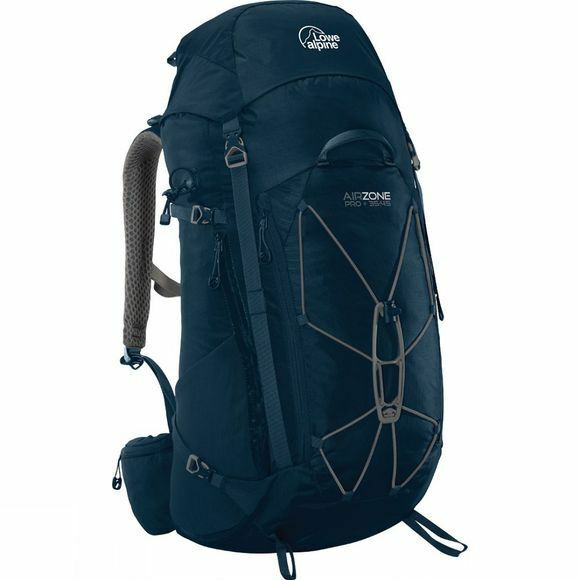 The Lowe Alpine AirZone Pro 35:45 Rucksack is a versatile four-season pack as it is large enough for winter hikes, as well as overnight light-weight summer ones. Featuring the AirZone Centro Adjust back system which facilitates a range of back length options for your comfort. The simple three stage action will allow you to set up with ease. Further comfort is added by the adaptive fit hipbelt and harness, ensuring the best fit for your pack, whatever the day has in store. It is hydration compatible to ensure you have easy access to a cool refreshing drink when working hard. The front storage bungee cord and spider plate makes for quick and easy stowage of bulkier items, while the stretchy pockets on the hipbelt and sides of the pack are ideal for stashing snacks, tissues, and extra drinks bottles. There is also an easy access side entry point, meaning maximuim access whilst ensuring the contact areas of the back are not on the ground. The lid rises to create the extra 10 litres of space for that extra kit you may pick-up along the way. Kit straps will keep walking poles or an axe in place while an integrated raincover will help to keep the whole bag and its contents dry.